Representative of Neftchi Sports Club, Parviz Hasanov performed successfully in the Second World Draughts-64 Disabilities Championship held in the city of Mlawa, Poland, on August 21-31. The national draughts player scored 13 points in seven rounds (six victories and one draw) in the tournament with Swiss system and won the gold medal of the world championship. Championship was held as individual with the team competition, and the team standings included four players from the country as the sum of the three best results (2 men and one woman). The competition brought together disable draughts players from Moldova, Ukraine, Belarus, Lithuania, Azerbaijan, and Poland. 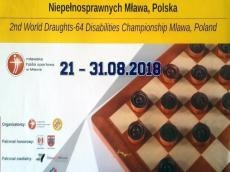 The Championship took place at the Mlawska Hala Sportowa with the organization of The International Draughts Committee of the Disabled (I.D.C.D. ), Mlawa Sport Complex, and Town Council of Mlawa.